Members of Boston Cecilia and concertgoers show their appreciation for conductor Donald Teeters Friday night. 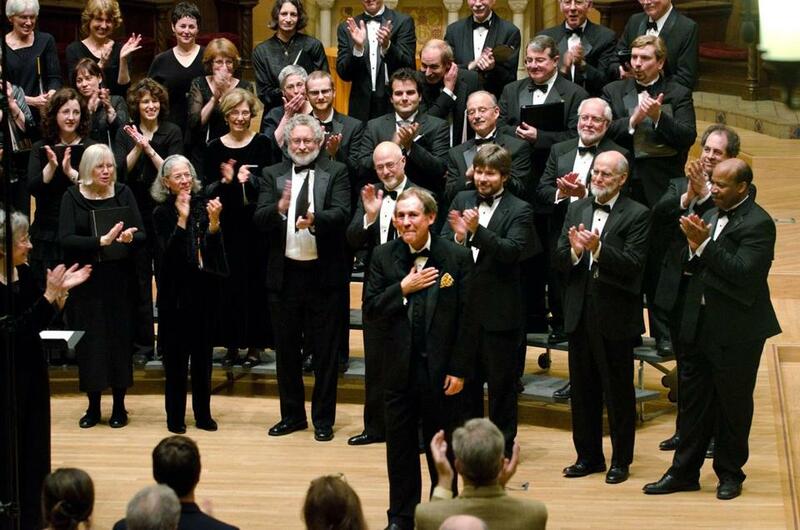 Teeters had been looking ahead to his final concert as music director of the Boston Cecilia, a program that took place on Friday night at First Church in Cambridge. It’s true he did not perform a grand Handel oratorio of the type he became renowned for leading over the course of his 44-year tenure. And true, there was an intimacy to Friday’s singing as delivered through supple and elegant performances. But if Teeters thought he might slip away into the Cambridge night without much fanfare, he was quite mistaken. A large crowd filed into First Church on Friday night, dotted with Boston music professionals, there to honor Teeters’s decades of achievement as a leading light of the city’s choral world. At the end of the evening, after these fine singers had received their due, the crowd showered Teeters with a prolonged and grateful ovation. In a way that seemed emblematic of his open and inquisitive musicianship, Teeters chose to end his tenure not with a victory lap through the Baroque repertoire for which he was best known, but by reaching for music of the present, with a program of mostly new and recent works, anchored by two new pieces by Scott Wheeler, the chorus’s composer in residence. The rest of the program featured music by composers with connections to Boston, either as distinguished music faculty (Arthur Berger and Donald Martino) or as former students (Andrew Rindfleisch and Tom Cipullo). Berger’s brief psalm setting, “Tov L’hodos,” is vigorous and impeccably crafted music. Cipullo’s “The Sky Over My Mother’s House” was a standout here, an arresting treatment of a text by Jaime Manrique shot through with nostalgia and yearning, captured in music of fluid gait and at times piquant dissonance. Martino’s “Seven Pious Pieces” renders 17th-century poetry by Robert Herrick in a bracing yet stately 12-tone idiom. And Wheeler’s 1991 work “Whiskers and Rhymes,” originally written for children’s chorus, features more exuberant settings of children’s poems by Arnold Lobel and Jack Prelutsky. Percussion, piano, and violin contribute festively to the mix. Throughout the night, Teeters led eloquent, well-prepared performances with a graceful yet completely unflashy style. Barbara Bruns and Carolyn Day Skelton were the capable pianists. Looking ahead to next season, three guest conductors — Dan Perkins, Amy Lieberman, and Nicholas White — will come to lead performances. One of the three will then be chosen as Cecilia’s next music director.